1. The ethical belief that self-interest is the just and proper motive for all human conduct: George's extreme egoism prevented him from thinking of anyone but himself. 2. 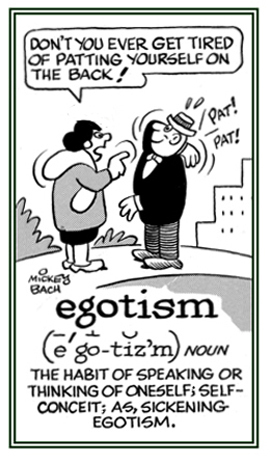 Excessive preoccupation with one's own well-being and interests, usually accompanied by an inflated sense of self-importance: Egoism is an excessive high regard for oneself involving boasting that reveals a person's conceit that shuts out everyone else. 1. Self-deification or the elevation of oneself to the status of a god: "In a New Age context, Egotheism can mean the deification of oneself or the claim that one has the qualities of God." 2. The deification of man's own conceptions of God, or the belief that man's conception of God is all that men can ever know about God. An excessive and objectionable reference to oneself in conversation or writing; conceit; boastfulness: Jane's daughter receives letters from a friend that are filled with overwhelming egotisms about his success as a musician. Egotism is the inflated perception of regarding oneself more highly than is justified by the facts, of bragging about one’s abilities or achievements, and the too frequent use of “I”. Egotism is the anesthetic that dulls the pains of stupidity. A belief in ghosts and their power to affect men. 1. The ability to change color when subjected to an electric charge. 2. The phenomenon displayed by some materials of reversibly changing color when a burst of electric charge is applied. Various types of materials and structures can be used to construct electrochromic devices, depending on the specific applications. Electrochromism involves electroactive materials that show a reversible color change when a small DC voltage is applied. 1. The magnetic field around a wire or other conductor when, and only when, current passes through it: "Electromagnetism consists of electric fields and magnetic fields and both fields are simply different aspects of electromagnetism, and so they are intrinsically related because a changing electric field generates a magnetic field; and a changing magnetic field generates an electric field." 2. The branch of physics dealing with the observations and laws relating electricity to magnetism, and with magnetism produced by an electric current: "The environmental electromagnetism indicates not only the fact that we live our lives in a constant state of bombardment of electromagnetism, but also that all of the energy from all of the collective devices in use in the world today, is currently going to waste." 3. Magnetism produced by a current of electricity: "Electromagnetism is all around us because in addition to natural sources; such as lightning, it's also given off by every electronic gadget, device, or machine that people make." 4. The interaction between magnetism and electricity, and the phenomena produced by this interaction and the scientific study and applications of such observable events: "Electricity and magnetism were long thought to be separate forces until the work of Michael Faraday and James Clerk Maxwell showed that the phenomena associated with lightning and magnets were both caused by electromagnetism which is considered to be one of the four fundamental forces of nature." The effects of electromagnetism include the "static" forces that electric charges and currents exert on one another, the radio waves we depend upon for much of worldwide communication, the light we see by, and, at the highest energies, the gamma rays generated in stars and particle accelerators. New York; 1992; page 726. 1. The curving movement or growth of a plant in response to slight electric currents. 2. A turning toward or a turning away from a source of electrical energy. 3. The movement of a cell or organism in response to an electrical stimulus. 1. The movement of a cell or organism in response to an electrical stimulus. 2. A bodily orientation in relation to an electric current. 3. A curvature of sessile (permanently attached) organisms toward or away from an electrical current stimulus. The doctrine that the physical world issued forth from God or some other divinity. The condition or property of being enantiomorphous. 1. The occurrence of highly adapted plants or animals in a particular geographic area. 2. The ecological state of being unique to a particular geographic location; such as, a specific island, habitat type, nation, or other defined zone. To be endemic to a place or geographic area means that it is found only in that part of the world and nowhere else. Showing page 19 out of 63 pages of 943 main-word entries or main-word-entry groups.